When Sean Longstreet ’06 arrived at Walnut Park Middle School, he was assigned to teach choir and general music because the school didn’t own any instruments. 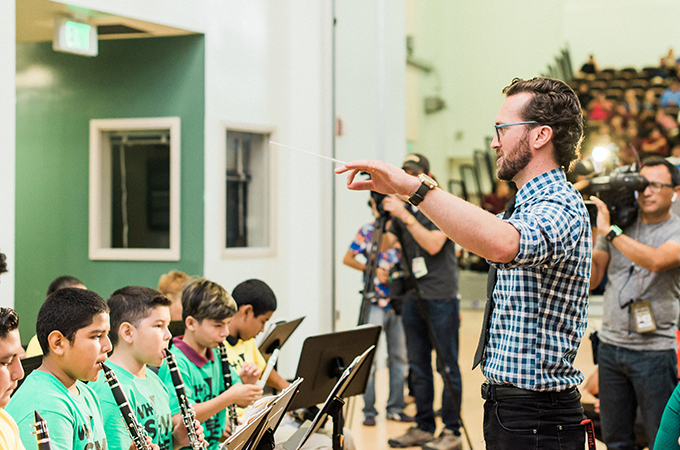 Two years later, not only can students enroll in instrumental music classes and three levels of band, Longstreet has been named a Los Angeles Unified School District (LAUSD) Teacher of the Year. To help build up the music program for his students, Longstreet applied for and received grants from Little Kids Rock and the VH1 Save the Music Foundation. Last August, Walnut Park Middle School held an assembly to celebrate the donation of instruments from the VH1 Save the Music grant. During the event, the middle school band played the new instruments, and pop musician Noah Cyrus performed and answered questions from the student audience. Originally from Hemet, California, Longstreet earned a degree in music education from the University of Redlands. His desire to be a teacher started early—inspired by his own experiences in the public school system. His passion was encouraged during his time at the U of R, where he studied both music education and jazz guitar. He says School of Music faculty members Katherine Hickey and Eddie Smith were especially influential. Longstreet was named among 22 Teachers of the Year last month by LAUSD, the second largest district in the country, employing over 26,000 elementary, middle, and high school teachers. Around 1,000 teachers were nominated for the award.